In the some configurations Cursor Hider prevent screensavers properly working. We added setting "Check Screensaver activity" to fix it. Turn on (or off) this checkbox when Screensaver starts flashing - opens and immediately closes and so repeats again. 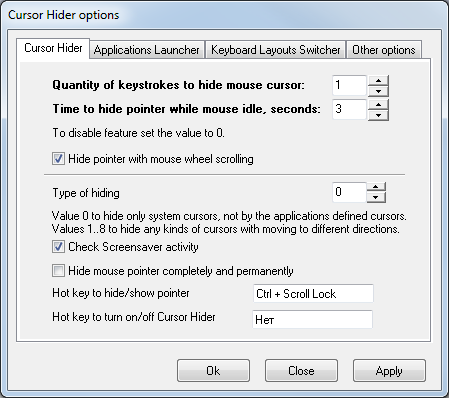 Cursor Hider is checking that screensaver is running and is not doing any mouse moves and keypresses. By default this setting is On. Options. Check Screensaver activity checkbox is On.